According to a new study by physicists at the Japan Aerospace Exploration Agency, the burning temperatures of the Sun's corona may be caused by countless explosions from the Sun, each too small for scientists to detect. Even though it is farther away from the sun's core, the uppermost part of the Sun's atmosphere - the corona - is much hotter than the surface. The corona regularly reaches temperatures of 1 - 2 million degrees C (1.8 - 3.6 million degrees F) compared to the surface which only reaches up to 5,500 degrees C (10,000 degrees F). "We think nanoflares range from a billion to a million times smaller than a regular solar flare," said Shin-nosuke Ishikawa, lead author of the study. These nanoflares would produce about 10^19 joules, the equivalent of about 10 billion tons of TNT. 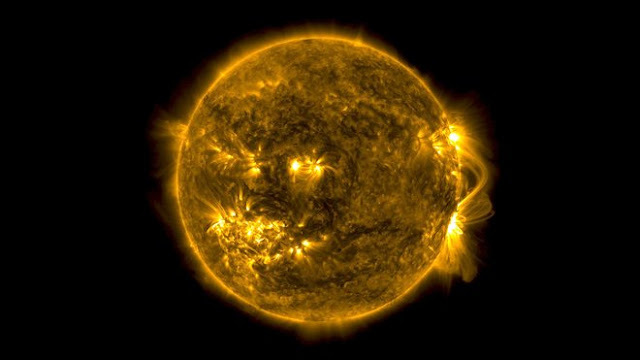 Using X-ray data of solar activity taken by the Focusing Optics X-ray Solar Imager (FOXSI-2), the team of scientists discovered highly energetic X-rays, a signature of super-heated solar plasma, over a region of the sun that had no visible flares.